STOW, OH – Feb. 28, 2014 – Mickey Thompson’s innovative new light truck tire, the Deegan 38, is scheduled for availability in April. Developed with five-time Lucas Oil Off Road Racing Series (LOORRS) champion and 16-time X Games medalist Brian Deegan, the Deegan 38 is the ultimate mud-terrain tire delivering aggressive performance, respectable street manners and impressive style. 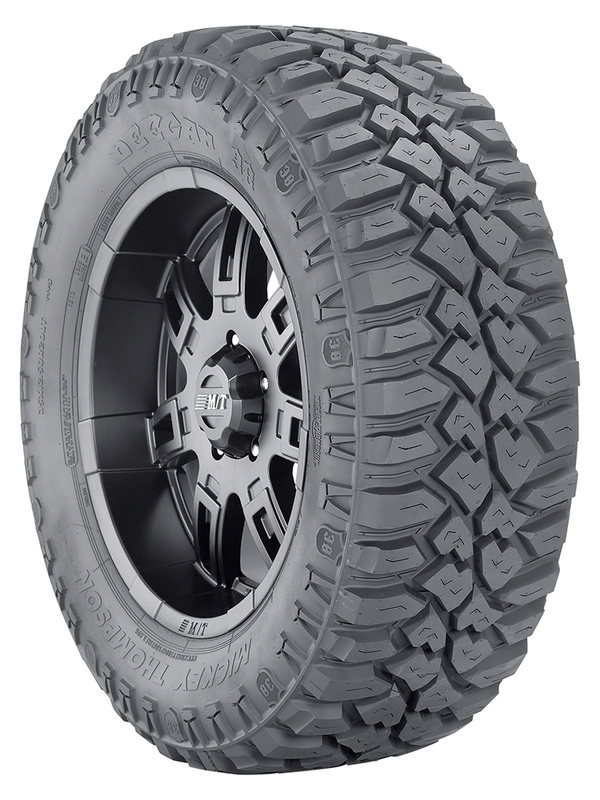 The tread consists of Mickey Thompson’s proven compound and a number of unique design elements: The beveled tread edge enhances self cleaning and lug integrity; special wide lateral and offset grooves channel water away to handle mud and rocky terrain; large center tread elements deliver better grip, even wear and a quieter ride; stone ejector ribs resist dirt and mud. Along the shoulder, Mickey Thompson’s SideBiters® and unique shoulder scallops guide mud and loose soil away from the tread. The enhanced sidewall design includes high tensile body ply cord for increased sidewall integrity, reduced rolling resistance and heat buildup. The tire’s sidewall depicts a Deegan 38 shield and raised white or black lettering. Proudly made in the USA, the Deegan 38 will be available in 13 popular sizes. For more information, visit http://www.mickeythompsontires.com/truck.php?item=Deegan38. Max-Trac Tire Co., Inc., dba Mickey Thompson Performance Tires & Wheels, markets racing and high-performance tires and wheels for street, strip, truck, and off-road applications. The company was founded in 1963 by racing legend Mickey Thompson and is headquartered in Stow, Ohio, USA. For more information, visit http:/www.mickeythompsontires.com/, http://www.mickeythompsontires.com/about.php. Motocross legend, 2013 LOORRS Pro Lite Champion, and 2013 DirtSport’s Driver of the Year, Brian “The General” Deegan is one of the most decorated action sport athletes to date. He is the only rider to compete in at least one event each year since the X Games’ inception, including his Gold Medal run in X Games 17 RallyCross. His 2013 accomplishments include a top five finish in the GRC series, and he continues to test the limits in numerous racing categories including Freestyle Motocross, Pro 2 and Pro Lite Short Course, Rallycross, Monster Jam and Stock Car. Deegan is powered by Rockstar Energy Drink, Ford Motor Company, Mickey Thompson Performance Tires & Wheels, Makita Industrial Power Tools, FRAM Filtration, DVS Shoe Co., Deegan 38, ODYSSEY® Battery, Gibson Exhaust Systems, 4 Wheel Parts, RePlay XD, Rigid Lights, Alpinestars, MYPLASH Prepaid MasterCard®, Fathead, Feld, Ronin-Syndicate, Atomik R/C, PPG, Fathead, Brembo, Fortin, VP Racing Fuels, Fox Shocks, Impact by Mastercraft Safety, MSD Ignitions, FK Rod Ends, Eibach Springs, McKenzies, Fiberwerx, JE Pistons, QTM, Roush Yates Engines, G2, Dailey Engineering, Brown & Miller Racing Solutions, ARP and AZ Driveshafts. For more information, visit http://www.briandeegan.com/, Follow on Twitter athttp://www.Twitter.com/MMGeneral, Instagram via BrianDeegan38, or visit on Facebook at http://www.Facebook.com/mmdeegan.